Long, complex route is best done during the Easter Jeep Safari. This trail is extra fun with lots to see, including dramatic arches, several overlooks, cathedral-size caves and an old mining camp with cabins. 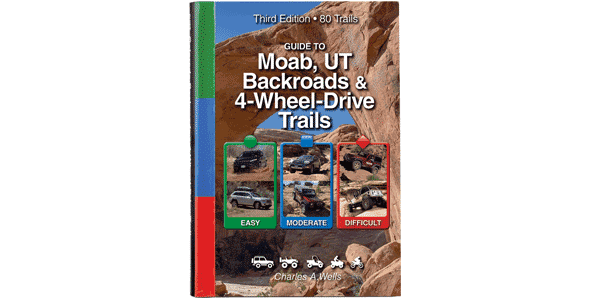 A great trail for ATVs and UTVs, but you’ll have to enter a different way than licensed vehicles (see map and separate directions in mileage log). Steep and rocky with moderate ledges in a few places. Wet conditions can increase difficulty. Route-finding can be confusing, especially if new mining roads are built without warning, as happened with the first edition of this book. Aggressive stock SUVs can manage this route with experienced driver if you stay on the route described here. Did this trail today WITHOUT the GPS or any other device other than cell phones and the Moab Fun Treks book. Very confusing, wish we had the Fun Treks data card and our GPS for this one for sure! We managed to find our way out, but missed seeing several locations that we wanted to go to. Will try again after we get the data card or the app, but will probably be a year before we can come back to Moab.